The Tadpole Shrimp. Another strange, ancient creature which brings to mind times long past and life long dead. They are also known as shield shrimp and Triops, and are indeed sort of tadpole shaped, look quite a lot like a shield with a tail and are related to true shrimp. There are 16 species in all and almost everywhere in the world has at least one of them. 6 of the species are in the genus Triops, meaning three eyes, which is another feature they have, and that name has spread to all the other ones. 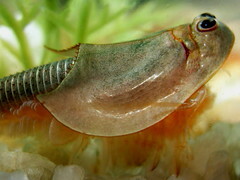 A large tadpole shrimp might reach about 10 cm (4 inches) in length, others are smaller. They are found in freshwater ponds, pools and puddles and, like some kind of desert plant, they are geared up to take advantage of irregular rains and long periods of desiccation. There is one species called Triops cancriformis that has barely changed in 220 million years. That's about the time the dinosaurs STARTED, in the Triassic, before any of the really famous ones, any of the really big ones and just before the Jurassic. This makes Triops cancriformis the oldest living animal species in the world. Naturally, tadpole shrimp as a whole go even further back so they are clearly doing something right. And it isn't prettiness, so let's see what might be so special about these little old age monsters. Why don't we start at the eyes? They have two compound eyes which can apparently see quite well at short distances. Between them is another eye retained from when they were tiny larvae. It's called the naupliar eye and is used to tell light from dark. There is a kind of window on their underside through which the naupliar eye can see, so they can see both the light and the dark at the same time and ensure they are in the right place. Tadpole shrimp have up to 70 pairs of legs, more than any other crustacean, and they are put to good use. The first two pairs have several long, thin strands coming off them. They look a bit like insect antennae and are used in a similar way, sensing their surroundings and finding worms and such as they dig around in the mud. Their actual antennae are almost gone, so I guess they're pretty glad for this alternative. They actually eat just about anything, from algae to each other. And you thought YOU were omnivorous! Unless you're vegetarian, but let's not open that can of soya beans. The other legs are used for breathing, swimming and bringing food to the mouth. That's quite a lot for a bunch of legs, so they are suitably complicated to accomplish all tasks. Each one has 6 lobes on the inner side for getting food around, and two lobes on the outer, one for swimming and one that has become a gill for breathing. The first 10 leg pairs (aside from the antennae ones) also have other functions for feeding. They swirl up the mud looking for morsels and can even cut them into pieces before pushing them up to the mouth. When it comes to reproduction tadpole shrimps are remarkably diverse. Some species have males and females. Some have hermaphrodites where mating results in two tadpole shrimp with fertilised eggs, or where an individual can fertilise its own eggs. Others use androdioecy, where you have lots of hermaphrodites and a lower number of males. Some can do parthenogenesis, where females lay eggs without mating at all. 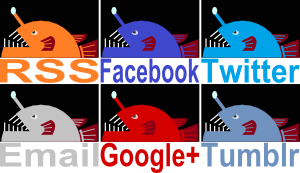 Some have a mixture of these various options and some have a different strategy depending on where in the world they are even though they are of the same species. Propriety means nothing to the tadpole shrimp, it's ALL about getting the next generation out there. The eggs that are laid have extremely thick skin, and not just to bear with 'your mum' jokes. Rather they can tolerate an extraordinary range of hardship, from freezing to desert heat and drought. They can wait around for years, get carried and kicked around all over the place before hatching when they finally find a nice freshwater body. Young tadpole shrimp grow very quickly, attaining adult size in one or two weeks. This entails moulting once or twice a day, littering the place with their disused, one-size-too-small exoskeletons. They might eat it afterwards, so at least they can clean up after themselves. Even though they only live for 1-3 months, make no mistake, this is a crustacean bent on survival. An extraordinary growth rate fed by a big appetite for just about anything alive, an "anything possible" attitude to reproduction to produce eggs that can lie in wait for years before hatching. This is a creature that has been around for aeons, and they seem intent on enjoying life for several more to come. Thanks will have to be passed on to the photographers! We have shield shrimp here in Australia, and we wondering how you harvest the eggs. Will the eggs hatch in the tank with the parents, or do they need to be dried out for some time before they will hatch? It sounds like only a few eggs will hatch in the same tank as their parents. Others need to dry out for a while and still others need to dry out two or three times. They're really good at putting their eggs in lots of different baskets!